With the dark black walls, this Colonial style room is jettisoned into the 21st Century! It is very similar to this room + style board I created for my son's nursery last year, since this was the first version I made for him, but went another direction. I want to point out the two art pieces shown here: Bears by Marc Davis (also featured here and here), and "Cole Canyon (Arizona)" by Edgar Payne, two of the greats!! Be sure to check out today's "Get the Look" & "Color Palettes with the Masters" posts too! I've got a lot planned the blog this week, so please stop by again for Art inspiration + more!! 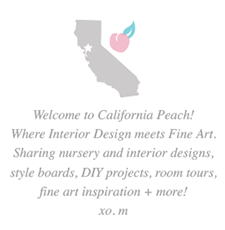 Follow California Peach's board Nursery | Colonial, Frontier, Western on Pinterest.